Krissi's Art Studio: Skelekitty.com Grand Reopening Giveaway #6: PIE AND CUPCAKES! Skelekitty.com Grand Reopening Giveaway #6: PIE AND CUPCAKES! Welcome to the 2013 Skelekitty.com Grand Reopening Shenanigans Giveaway Extravaganza Event, Part VI! Along with the help from some talented friends, I am celebrating the relaunch of my online shop (now with a proper shop host and my very own URL), by giving away awesome stuff. 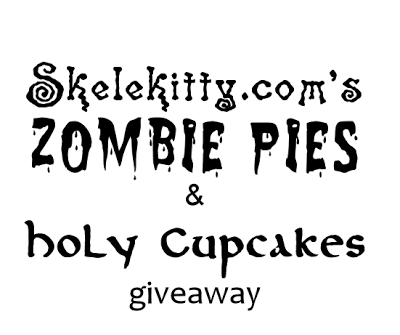 The Pies and Cupcakes GIVEAWAY IS CLOSED. Scroll down to see who won! More giveaways are coming soon! 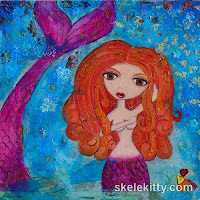 The 'consolation sale' for Giveaway #5 includes every item featuring the red haired mermaid and fish from Something's Fishy. That means you can get prints for $10 or pendants starting at $15 (with a few extra special goodies in there too). Want earrings with just the fish? OK - let's make a deal (that means e-mail me for the 35% off price and listing since they're not currently up in the shop). As usual, no coupon is needed and the sale is active until the winner of this giveaway is announced! 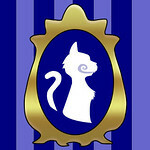 Click here any time to see what's on sale at Skelekitty.com! The entry period for Giveaway No. 6 begins at 6pm (PST) on Tuesday, January 22 and ends at 9pm PST on Thursday, January 24.
a Sara Lynch zombie pie bird! My original Cupcake o' Guadalupe design glass tile ring, yes, I said "ring!" May your cupcakes always be fluffy and moist. Let us pray. I met Potsdam, NY painter, photographer and ceramics artist, Sara Lynch, when I first joined Google+ last year (you can add Sara to your circles - and me too). It was love at first ... whatever we call it here on the world wide interwebs. She was funny, sarcastic, friendly and creative and, while I keep it off most of my official fan pages, she also swears like a longshoreman (just like me). Because I also kept active on Facebook, I immediately stalked her over there and then went looking for her online shops. What I found was something I'd been wanting for a long time - a pie bird. 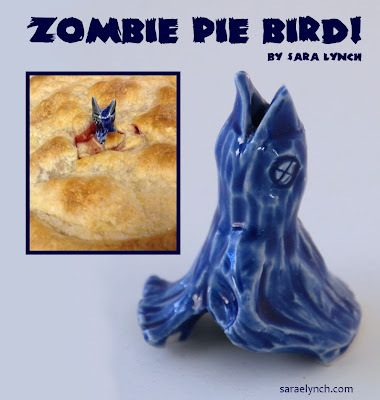 But not just any old pie bird, a HANDMADE, ZOMBIE pie bird, complete with little "x"s for eyes! I ordered two (and a little yellow birdie shot glass). but he's bursting through a heart. Not only did the pie bird do what it was supposed to (that is, it vented steam from the pie to prevent cracking and distortion of the crust), but it looks great on my shelf as a knick-knack when I'm not baking. 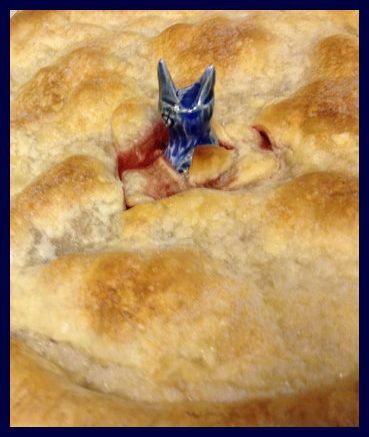 Also, for the record, there is absolutely nothing as cool as bringing a pie to a party that has a zombie bird poking its way out of the center. Nothing. 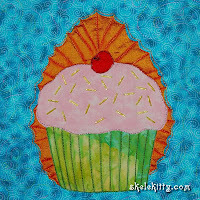 from one of my 2007 art quilts. Since I don't (currently) have anything zombie-themed in my shop to go with this, I briefly thought about doing birds, but decided to go the ironic baked goods route instead. So I am giving away one of the limited edition 1" glass tile rings (silver plate/adjustable setting) with the image from one of my early art quilts - BEHOLD! The Cupcake o' Guadalupe! The entry period for Giveaway No. 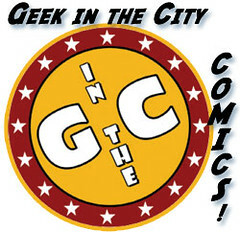 6 begins at 6pm (PST) on Tuesday, January 22 and ends at 9pm PST on Thursday, January 24. THE WINNER WILL BE CHOSEN AT RANDOM from all valid entries, and will be announced and notified by e-mail within 24 hours of the close of the entry period. Prizes will be mailed within 7 days after shipping information is received via USPS First Class Mail with delivery confirmation. Here are THE ENTRY GUIDELINES, aka "how NOT to have your entry discounted, invalidated and/or ignored." I recommend everyone read the guidelines. Got it all? Off you go, then. I love the collaborations for your "Shenanigans"! I've seen this zombie bird around and would love to give it a good home along with a beautiful piece of wearable art. The more of Sarah Lynch I see, the more I fall in love. I'm gonna be taking up pie baking just to use THESE pie birds. zomg the bird in the pie is awesome!!!!! You are terrific! Always promoting and giving away insane items! What an awesome giveaway this has been, thank you and thank the sponsors! I've been stalking the pie bird since the contest started! I'm sitting here looking at the spot said bird will inhabit should it come to live with me. I'm not obsessed.... okay, a little. AND, the darling cupcake ring?!? 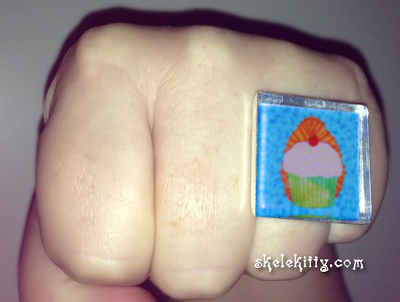 I love big splashy adorable jewelry, and a cupcake I can enjoy without expanding my waistline? SCORE!!! Thanks, Sara, for leading me here. Now that I know that the Cupcake o' Guadalupe exists, I must have one! I can't even believe the amount of goodies you're giving away! Great art from Skelekitty and new (to me) artists to fall in love with!